This Bethnal Green boozer has been here, in some guise or another, since the early eighteenth-century. Today it's under the Antic group, and you can expect gastro pub fare of a British bent alongside a solid selection of real ale. Lovely regulars, lovely staff, lovely food, lovely drinks, lovely beer garden, lovely DJ - OVERALL BLOODY LOVELY! Cosy pub with great grub. Definitely worth a trip for the Sunday roast on offer! This pub is fantastic, largely due to the fact that pints are below £5, an aperol spritz is £7 and they have a beer garden that's absolutely the place you want to be when the sun is shining in London. If you do happen to miss those two odd days don't fret! There's plenty of room inside to enjoy your drinks and start your night out. Walking distance from the Working Man's club, which is another Bethnal Green gem! What my friends like to refer to as ‘cute boys’ pub. They’ve got a point, there is a distinct gathering of young East London men here. The pub itself is decent, with 1970’s decor and mismatched furniture. It’s a good pre-night out drinking pub. A great pub with great food and a cat! 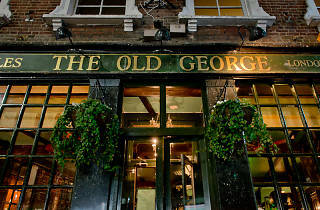 Best pub on the high street, always have the best music on and have always received the best service. Managers and bar staff are always so friendly and helpful. Please don't change! There's an awesome beer garden and the Resturant is absolutely stunning! All the staff are very friendly and helpful and I haven't even mention the pubcat!!! Patches the muse of Old George is a great touch to the pub. Overall awesome. Deffo be coming back. It feels like a second home!! Great atmosphere, great food and friendly staff! Also a fun night out on Fridays and Saturdays with good DJs playing. Beer garden is huge too. Brilliant pub, lovely staff and just an awesome time. The most friendliest pub on the high street. You'll definitely have. Great time here. Friday's and Saturday's even have a DJ!!! Let's not even get started on the food because it's to die for! The restaurant on the first floor is one of my best dinning experience so far. Highly recommended. A great local. A good selection of drinks which are reasonably priced, massive beer garden for sunny days and a decent quiz on a Wednesday. Foods pretty good and you can usually find yourself a seat at all but the busiest of times. Excellent boozer and amazing food in the new restaurant! Amazing pub! The manager is super lovely. 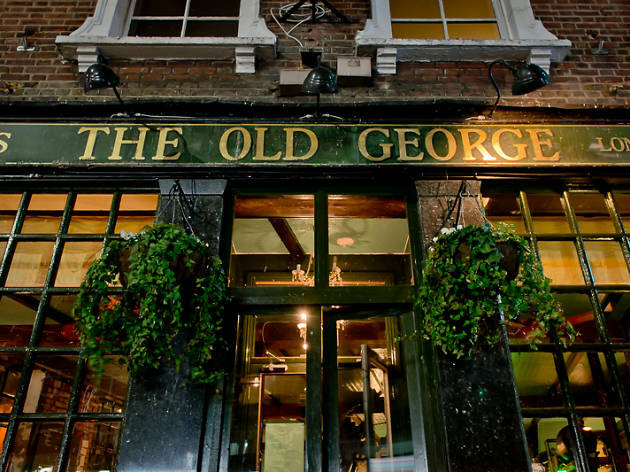 Summer or winter, the Old George atmosphere is always great, people are nice, in one simple word... Amazing!! Love this pub. Great drink, better food, even better looking kitchen staff. An all round hoot! Exceptional food and a great selection of drinks. Very friendly staff and atmosphere, well worth checking out.